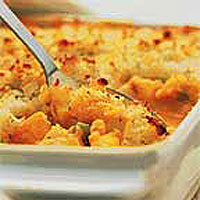 Here is a warming dish that is easy to make for a family meal. It combines traditionally smoked haddock, potatoes and the convenience of a ready-made sauce. Preheat the oven to 200°C, gas mark 6. Place the potatoes in a pan of boiling water and cook for 10-15 minutes, or until the potatoes are tender. Then drain and return to the pan. Mash until smooth, then stir in the dill, horseradish, milk and butter. Season generously. Meanwhile, cut the fish into bite-sized chunks and scatter half into a 1.5-litre ovenproof dish. Scatter half the peas over the fish, then spread half the sauce over. Repeat these layers. Spoon the mash evenly over the sauce, then smooth with a fork to completely cover the filling. Bake in the preheated oven for 35-40 minutes, until the topping is crisp and golden. Serve with a seasonal green vegetable such as broccoli or cabbage. This dish can be prepared ready for the oven up to 24 hours in advance. Allow the potato mix to cool thoroughly before continuing with step 3. It can also be frozen for up to one month. Defrost thoroughly in the fridge before cooking.